The final mission to service the Hubble space telescope has slipped deeper into next year, Nasa has announced. Officials said the delay would give engineers extra time to prepare a spare control unit needed to replace one that broke on the observatory last month. Hubble was taken offline for four weeks by the failure but has since been re-booted using a back-up system. Meanwhile Nasa said the space shuttle Endeavour would launch on 14 November to the International Space Station. The Endeavour is being sent to outfit the ISS for six crew members instead of three. The 15-day flight will include four spacewalks to repair the station's power system and carry equipment to sustain the astronauts. It was hoped the Hubble reserve control unit could be made ready for launch by February. April is now the earliest date. The US space agency will then have to find a slot for the servicing mission in the sequence of construction and re-supply flights already planned to go to the International Space Station. Evidence that science data is flowing again on Hubble came with the release on Thursday of a spectacular new image of a pair of interacting galaxies known as Arp 147. Hubble's recent woes go back to Saturday, 27 September, just weeks before the fifth and final servicing mission was due to blast off. 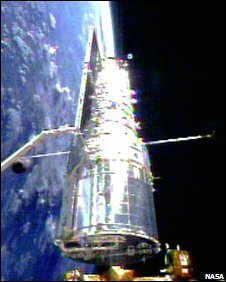 Hubble's main flight computer put the observatory's instruments in a protective safe mode when it detected a malfunction in the telescope's Science Instrument Command and Data Handling (SIC&DH) Unit. The anomaly was traced to a box that formats, stores and routes data gathered by Hubble's imaging instruments. 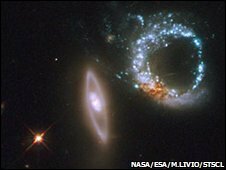 Engineers successfully switched Hubble over to a "B" formatter - but the failure left the observatory with no redundant capability. The spare unit Nasa now intends to fly on the rescheduled servicing mission is as old as the telescope and needs an extensive programme of testing before it is declared flight worthy. "Our plan overall takes something on the order of about six-and-a-half months from now," explained Preston Burch, Hubble Space Telescope manager at Nasa's Goddard Space Flight Center in Maryland. "There's about a month or so devoted to inspecting and resolving any of the performance issues associated with [the spare unit]; about three months for environmental tests; and then about two to two-and-a-half months to do final testing and shipping down to the Kennedy Space Center and getting it installed on the orbiter. "In addition, there are also approximately three tools that need to be developed to facilitate its installation on orbit." The final servicing mission will be undertaken by astronauts on the Atlantis shuttle. The telescope's batteries and gyroscopes, which are used to point the telescope, are degrading and need to be replaced. The orbiter crew is also tasked with installing two new instruments: the Wide Field Camera 3 (WFC3), and the Cosmic Origins Spectrograph (COS). The new instruments will improve significantly Hubble's ability to probe distant, faint objects in the early Universe. The Atlantis astronauts must also repair two instruments that have failed in recent years - the Advanced Camera for Surveys (ACS) and the Space Telescope Imaging Spectrograph (STIS). If the work is carried out successfully, it should allow Hubble to keep operating into the next decade.